us by their patients or contacted us directly. Iodine testing and prescribing practices may vary. Please notify us if any of our listings need revising. to assess how iodine is used in their practices. 497 No. Harbor City Blvd. Iodine, bioidentical hormones, LDN and Natural Thyroid. Also offices in Stevensville and Denton. Frank O. McGehee III, M.D.,C.C.N. What defines an Iodine Literate PractitionerTM? 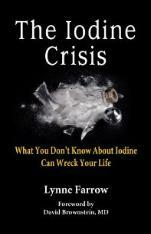 The Iodine Crisis by Lynne Farrow. 25- 50 mg dose was calculated. then Breast Cancer Choices does not recommend them. The information on this website has not been evaluated by the U.S. Food & Drug Administration. nonprofit organization managed entirely by unpaid volunteers. us at Breast Cancer Choices, Inc., PO Box 1567, Amagansett, NY 11930. Web page updated regularly. If there are no practitioners listed in your area we don't know of any.